This 21-story building was erected as a cooperative apartment building in 1961 and has 37 units. The white-brick building has an interesting roofline with curved elements. The facade has been substantially altered over the years with the addition of a large "wintergarden" window on the top floor and the enclosure of many its balconies that are flush with the facade. The building directly overlooks one of Central Park's most lovely features, a pond with a beautiful bridge as well as the Wollman Skating Rink. It also has fantastic views of the entire park and the skylines of Upper Fifth Avenue and Central Park West. 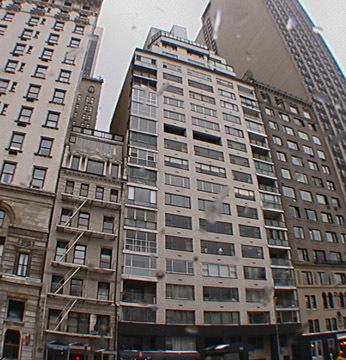 The building's location is spectacular except for the fact that it is adjacent to a low-rise building to the east with fire-escapes that is between it and the Plaza Hotel, one of the city's more incongruous juxtapositions. It is also adjacent to a subway entrance. 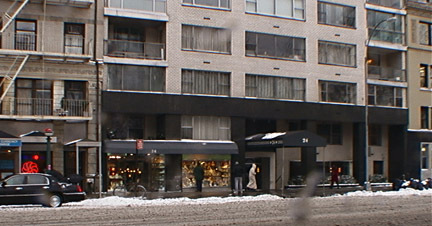 The building, which has a doorman, has a canopied, step-down entrance and a two-story, dark gray, polished granite base. 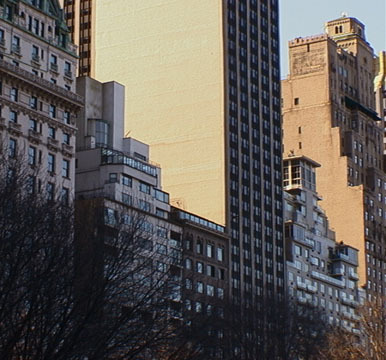 Historically, Central Park South was for many decades an surprisingly unattractive location despite its great location because of its narrow sidewalks, high traffic, a proliferation of street people who patronized guests at its many hotels and a lack of normal residential neighborhood amenities. At the end of the 20th Century, however, its ambiance improved significantly with the erection of several new luxury towers nearby and the opening of new restaurants and a supermarket not too far away and the long-delayed redevelopment of the New York Coliseum site at its western terminus. The parade of horse-drawn carriages along the north side of Central Park South on this block, of course, remains, adding a charm not shared by any other neighborhood.